The Libra and Taurus love compatibility might be two halves of one whole. Libra and Taurus soul mates seem to be karmically linked. They are both looking for protection in a relationship. They both adore, art, poetry, and culture. Their relationship might start slowly. Libra and Taurus love relationship will not seem to have much in common. However, once they learn more about each other and understand each other they will see they have more in common than they thought. Libra and Taurus zodiac signs are both ruled by the planet Venus. Venus is concerned with love and money. They will both adore beautiful things, sophistication, love and romance. Libra will value balance. Both of them have charismatic personalities. Libra dating Taurus will want balanced personal relationships. However, Venus influencing both of them can make issues. They both tend to be lazy and pretentious. The Taurus personality will be this way about material things. Libra will be this way about intellectual matters. Libra is an Air sign. They depend on intelligent exploration in their life. They prefer to focus on intelligent stimulation. They will do this whether it is rational or not. Taurus is an Earth sign. They depend on their inherent rationality in their life. They will want to know how their actions are going to help them achieve their goals. If the Taurus zodiac sign seems too clingy or Libra seems too flirty and sociable they might have arguments. They will have trouble sometimes not understanding where each other is coming from. In this Libra-Taurus compatibility, they will need to accept each other’s opinions as being different in tone and focus if they want to have a successful relationship. Libra is a Cardinal sign. Taurus is a Fixed sign. Librans will typically start things in this relationship and the bulls will keep them going. Taureans are not likely to be flexible. Libra will need to understand the Taurus birthday person has a stubborn nature. A kind and gentle persuasion can make anything possible. Libra is known for being gently persuasive and charismatic. At the same time, their indecisive nature might annoy the bull. Taurus is more blunt and straightforward. Taurus will need to take a step back on their way being the only right way. If they can do this, then Libra will be more likely to accept Taurus’ decisions. The best thing about Libra and Taurus compatibility in a romantic relationship is that they both love enjoyment, beauty, and culture. Both star signs will feel aesthetics are important. They have comparable tastes and loves. Because of this, their relationship is very romantic and balanced. Libra dating Taurus will have a strong magnetic attraction to each other. This is mainly due to both of them being ruled by Venus. Venus is the planet of love, romance, seduction, and beauty. Because of this, they will both be very focused on each other. They both enjoy the arts, music, delicious food, and the more sophisticated things in life. Both Libra and Taurus in love will love a traditional, old fashioned courtship. The relationship will get off to a great and admirable start. They will be most compatible when they both feel the Libra Taurus relationship is secure and stable. In this Libra and Taurus friendship, both have a strong love of the arts. They both admire sophisticated dining and theatre. They will both want to collect music and art. They both value pleasure, whether it is physical or aesthetic. They both love to pursue and be pursued in a romantic relationship. A true courtship will be necessary for any star sign compatibility between them. They both require this. Because of this, they will work well together. Taurus admires Libra’s charisma. Taurus is stubborn and if they do not get their way, Libra is gracious enough to be able to smooth things over and keep the peace. Taurus men and Taurus women are seductive and will give Libra luxurious things that they will admire. They can both learn a lot from each other. Taurus can learn to see all the different sides of situations. Libra can learn to overcome their infamous indecisive nature. Taurus male or Taurus female requires emotional security. Libra being compatible is based on balance and peace. They are not likely to rock the boat very much together. There is a certain stability. 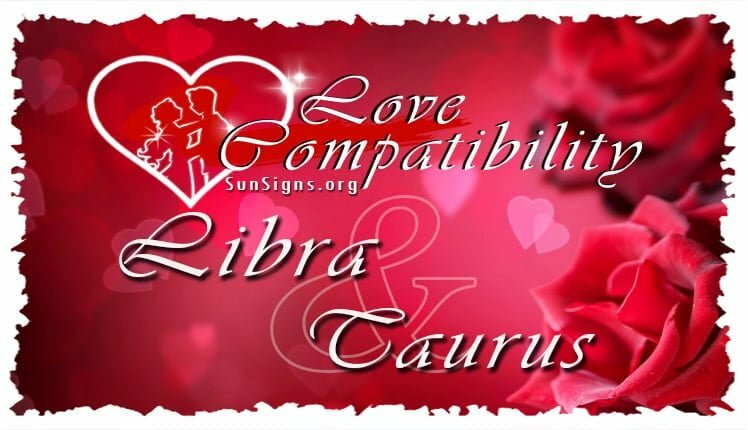 However, there is some contrast between the elements of Libra and Taurus love compatibility. Taurus is a grounded earth sign. Libra is an air sign. They are continually changing their mind and their mood. Libra wants balance, but they will go between two extremes to try to find that balance. Taurus will prefer to sit in the middle ground. They might not be able to tolerate Libra’s mood swings and indecisive nature. Libra and Taurus in a romantic marriage can learn a lot from each other when things are going well. Libra will be able to teach Taurus how to be more socially graceful and charismatic. They love an active social life. The bull will be more decisive and will be able to teach the Scales sign how important making a decision can actually be. They prefer to spend more time alone. Because of this, they might have arguments. Libra tends to be flirtatious. They do not mean anything by being flirty. Because of this, Taurus could be very clingy and envious. They do not like that. The love compatibility of Libra and Taurus is delicate. Libra can sometimes have unrealistic expectations of their partner. This can only make the issues they have in their relationship worse and lead to the breakup of the Libra Taurus couple. Libra is the mythological idealist. They will want everything to be perfect. They will always be trying to improve the relationship, whether materially or emotionally. They will be focused on how things could be or should be. However, Taurus is part of the how things are as of now. They will be very realistic about the relationship. They will easily become annoyed over Libra’s mood changes. They will not be able to understand why their relationship is never good enough for the Libran. Libra born will constantly be asking things like what if. Taurus will eventually reach a point where they will have to say the relationship is fine the way it is. If the Libra Taurus love compatibility is to be successful, they are both going to have to learn to work hard and compromise with each other. This earth sign and air sign connection can be very instinctive. However, they can have trouble holding onto their connection and love compatibility. When earth and air have a conflict, they could create a dust storm that has the potential to suffocate both the Libra and Taurus zodiac signs. If the Libra and Taurus relationship is to be compatible, they will need to build on their strengths. They both have a romantic nature that they can use to build on. Both will need to recognize their own weaknesses and try to minimize them as much as they can. If they do not take action, their relationship can have trouble. The relationship between the bull and the scales can be charismatic and special when it begins. If they do not take deliberate action, the relationship can become boring, routine, and passive. In this Libra and Taurus compatibility, both need to remember how strong their initial attraction to each other was. If they do not take it for granted and try to keep it going, they can have a happy and successful relationship.